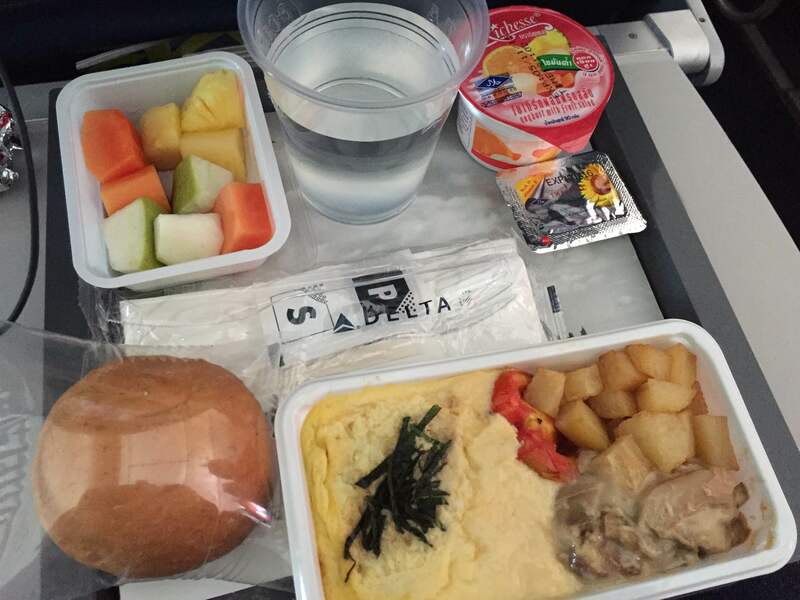 While normally a Star Alliance flyer, I had the opportunity to revisit Delta for the first time in five years on my recent flight to Los Angeles. 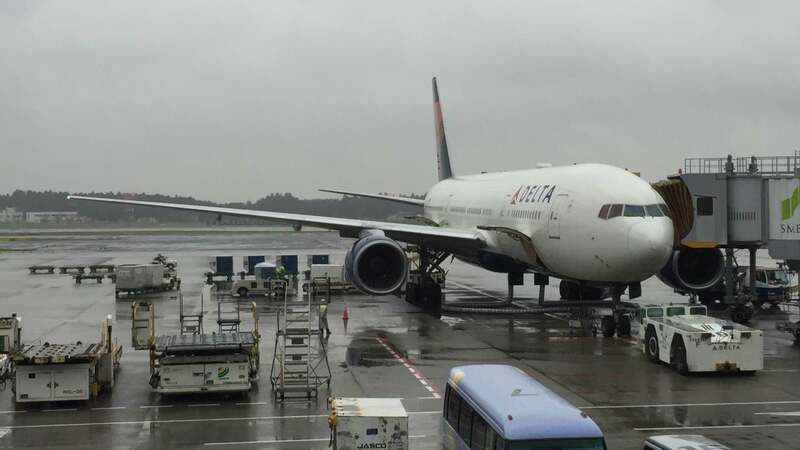 I looked forward to the opportunity, because I have read and heard good things about Delta’s service, comments from friends that it is the carrier that has defied the reputation of US-based carriers for poor service. The first flight was an early-morning departure from Bangkok’s Suvarnabhumi International Airport. 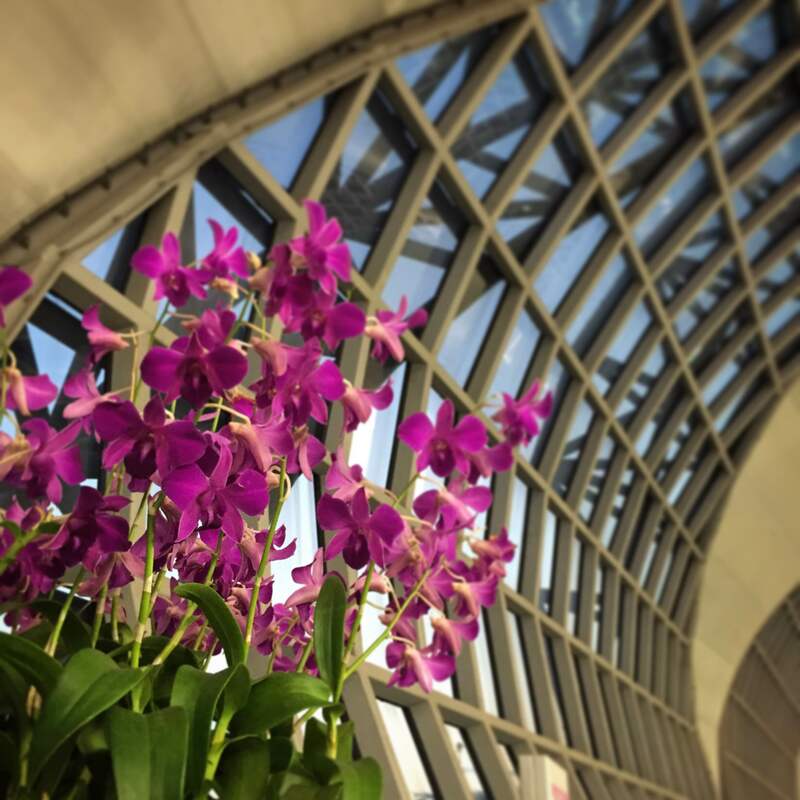 Now seven years old, Suvarnabhumi is settling into its own and is a decent airport to fly from. Delta’s check-in counter was not crowded when we arrived two hours before the flight and the security and immigration process was smooth and efficient. We encountered a bit of a challenge, as Tawn and I were traveling on separate reservations. When I checked us in online 24 hours earlier, I chose adjacent seats. Between then and our arrival at the airport, one of those seats had been reassigned. Thankfully, the gate agent was able to rearrange seats for us so we were together for the flight. Our flight to Bangkok was a Boeing 767-300ER. 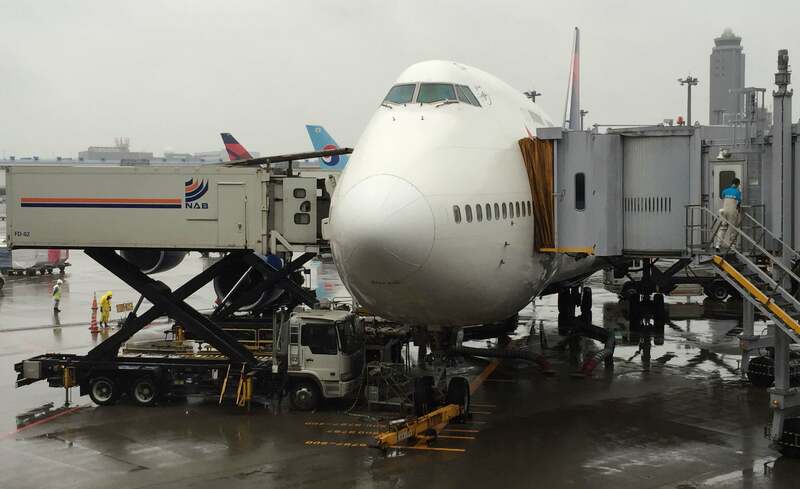 After years of flying 747s to Bangkok (first as Northwest and then after the merger as Delta), it is nice to see the use of a smaller widebody plane. 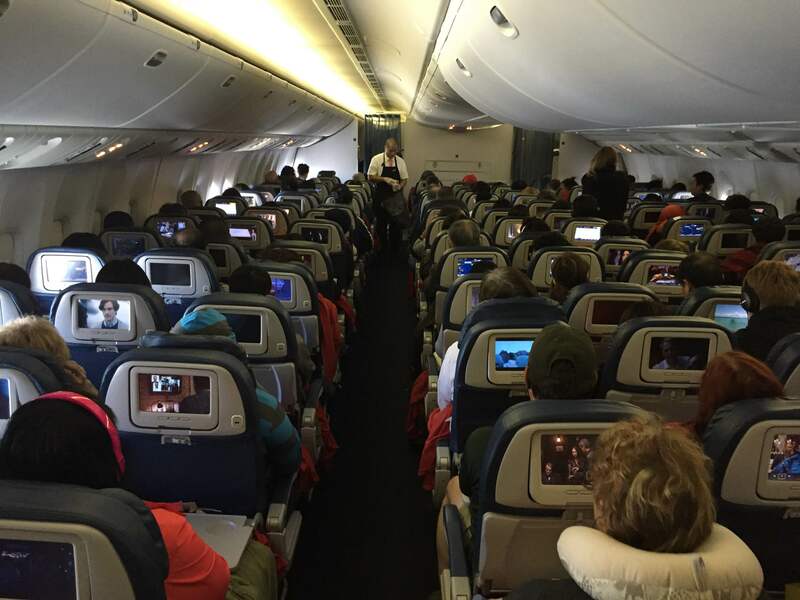 This capacity discipline helps the airlines focus on profitability over volume and I also think the smaller plane, with its 2-3-2 layout in economy class, is a better travel experience than the 9- or 10-abreast layout of larger planes. While we weren’t traveling in Business Class, I thought I would share a picture of the seat. The forward-facing seats are a bit utilitarian but look like a comfortable way to fly. The center section has two seats, so if you are traveling in a pair, you are not completely isolated from the other person. The economy class seats are clad in leather, a sea of dark blue that is visually dull but easy to clean. The cabin was clean and in good shape, despite the airplane being 15-20 years old. 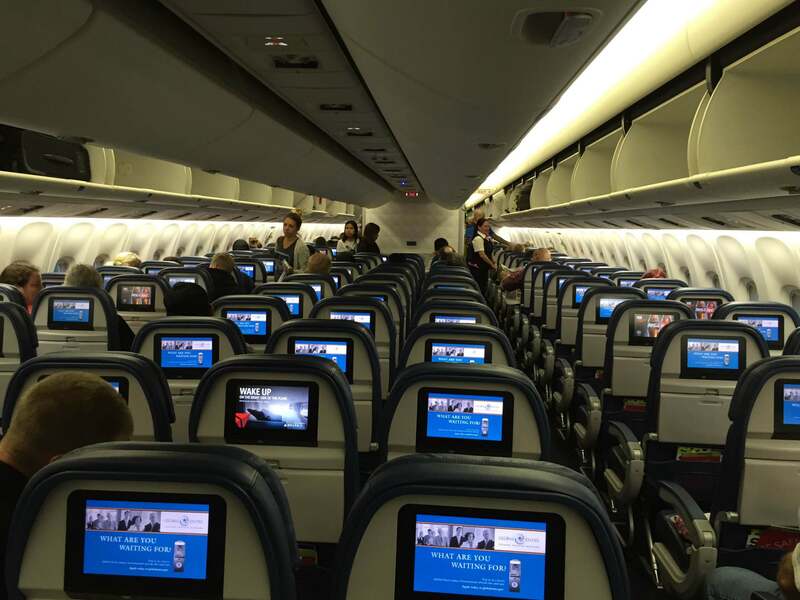 Delta’s entire long-haul fleet offers seatback monitors, with a ride range (hundreds) of TV shows, movies, music, and games. Monitors were bright, high-resolution, and responded quickly to your fingertip touch. Pairs of seats had universal power outlets and these monitors also featured USB plugs. 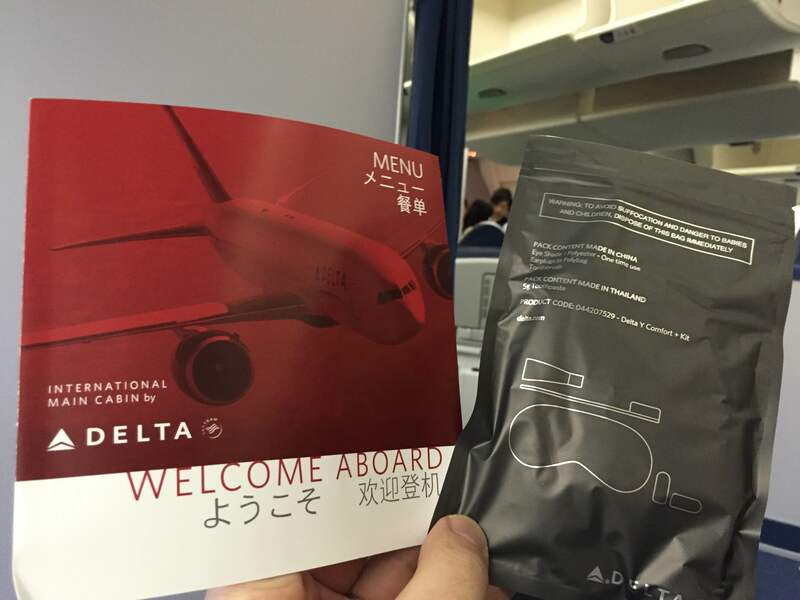 One nice touch that Delta has added (or replaced) is distributing free headsets and amenity kits. There was a point post-9/11 where the US-based airlines had cut back every amenity item, which seemed so stingy. 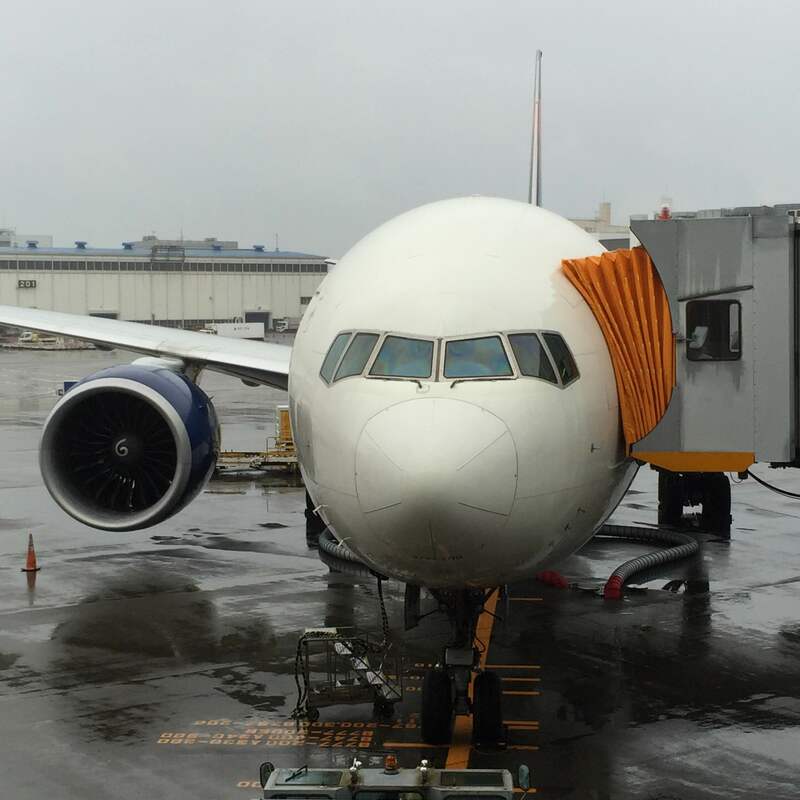 For this 5-hour flight to Tokyo, we had eye shades and ear plugs, plus the ear buds. Since the entertainment system uses a standard headphone jack, you can use your own jack or take the complementary ones with you to use again on your next flight. The economy class seats are arranged at a 31-32 inch pitch, typical for most airlines. The seats are reasonably comfortable, leg room and knee space is adequate but not impressive. As I mentioned, the narrower plane (only seven seats across instead of nine or ten) is more comfortable as nearly everyone is in a window or aisle seat. Once airborne, the cabin attendants began the inflight service: hot towels followed by a drink service, followed by breakfast. The staff was Bangkok and Tokyo based and was generally friendly. The taller flight attendant on the right had a particularly friendly manner to her, a typical “Midwestern Mom” top who was bright and outgoing. These are the type of cabin attendants who really improve the flying experience as they seem to enjoy what they do, which is infectious. As it was the final day of a month of vegetarianism for Tawn, I pre-ordered vegetarian meals for both of us. This ensured we were served at the same time. Above is the “dairy okay” vegetarian meal for me, a very cheesy scrambled egg dish that was tasty. 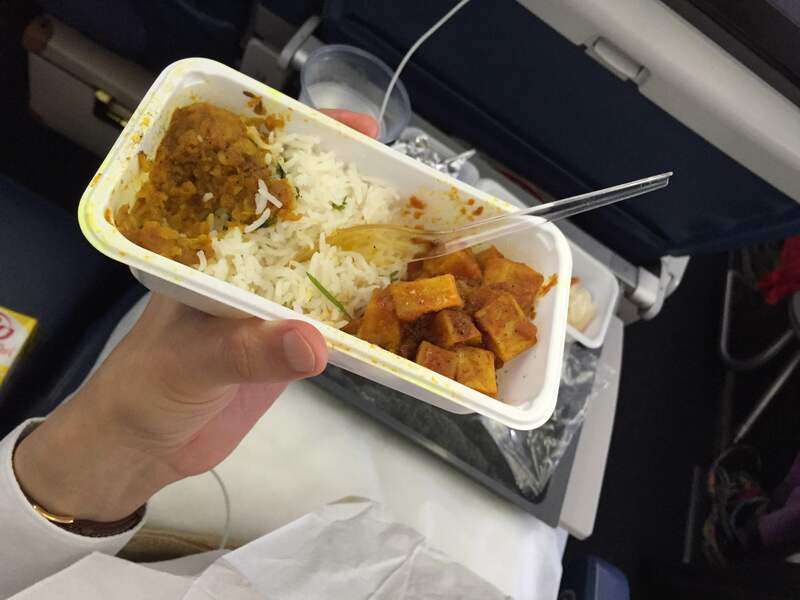 Tawn opted for the Asian vegetarian dish, which on both flights was more South Asian (Indian) in nature, except for the corn flakes! 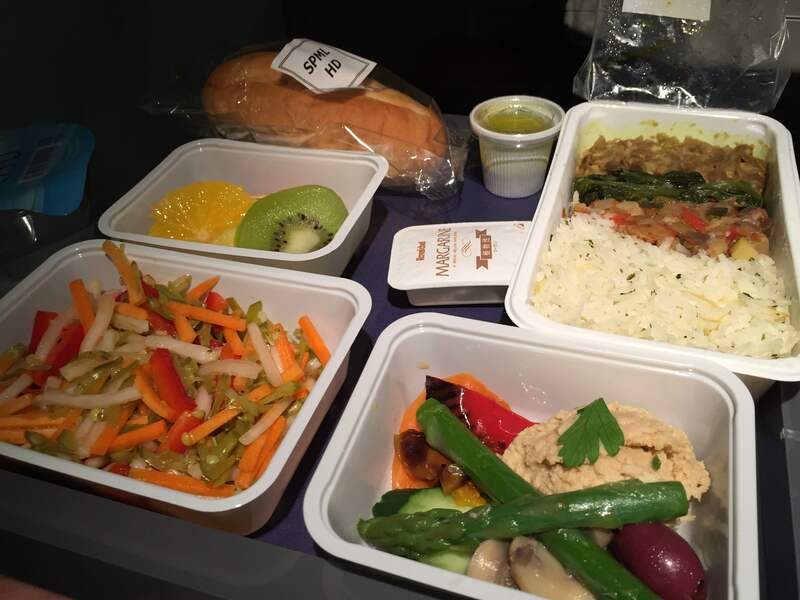 The food tasted fine, with strong flavors, and the overall quantity was appropriate to the length of the flight. 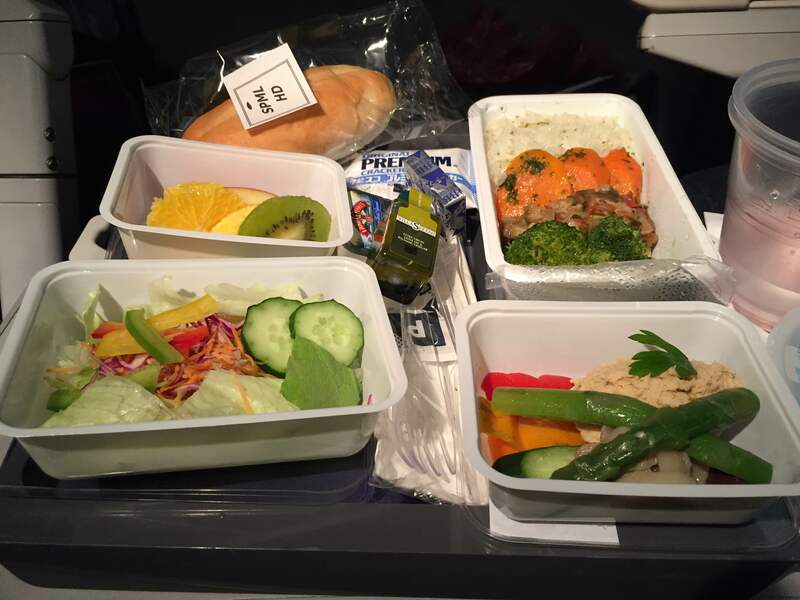 Expectations are never too high for airline food and by placing the bar at a reasonable level, were were not disappointed! 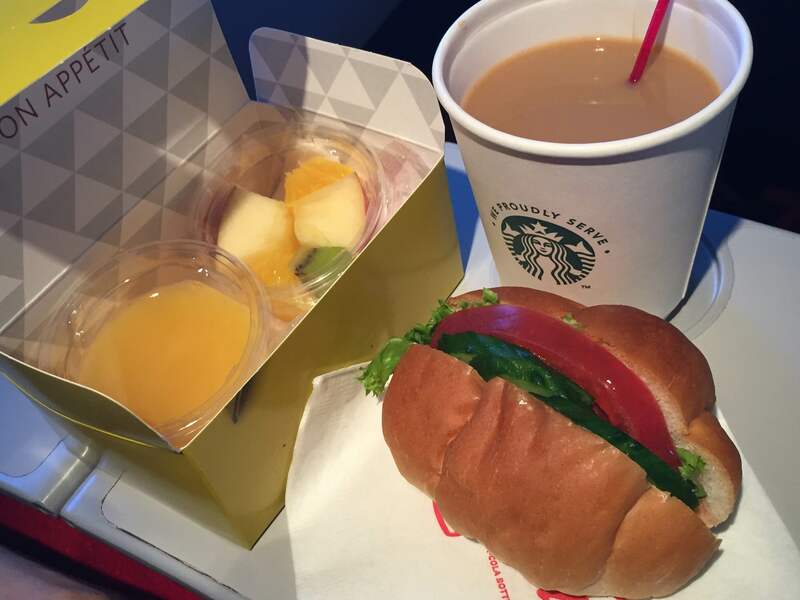 Near the end of the flight, warm sandwiches were served in an unappetizing-looking foil bag. 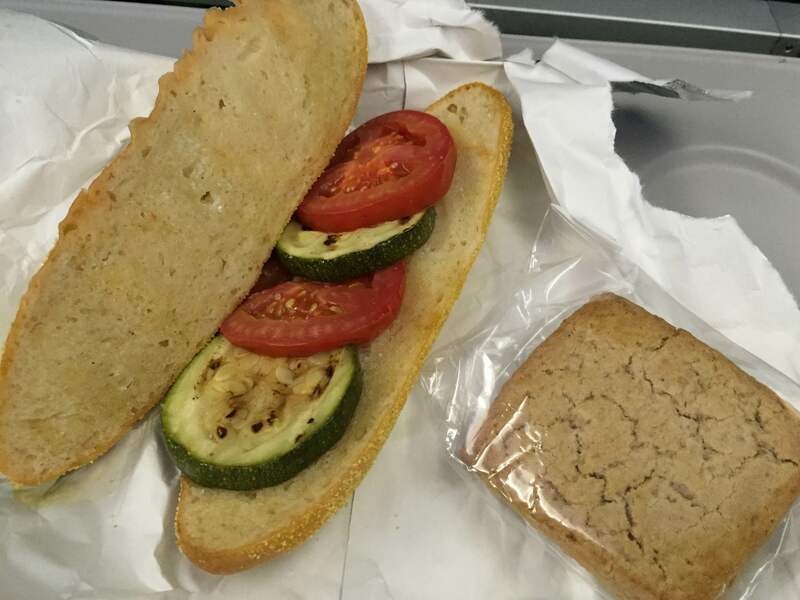 The roasted zucchini and tomato sandwich we received was surprisingly tasty – the cornmeal crusted roll was very nice – and was sufficient to stave off any hunger before arriving in Tokyo. The massive Boeing 777-200, the same type of plane we would fly into Los Angeles. The classic shape of the Boeing 747-400, which I love looking at but don’t really enjoy flying in economy class because of its dense, 10-abreast seating layout. 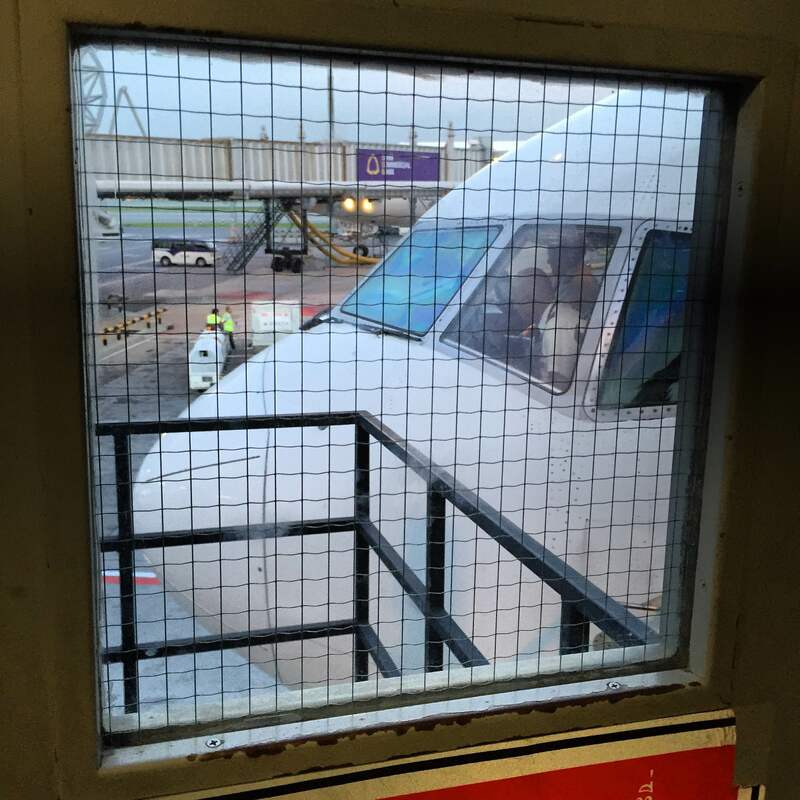 Our plane parked at the gate, about to board. 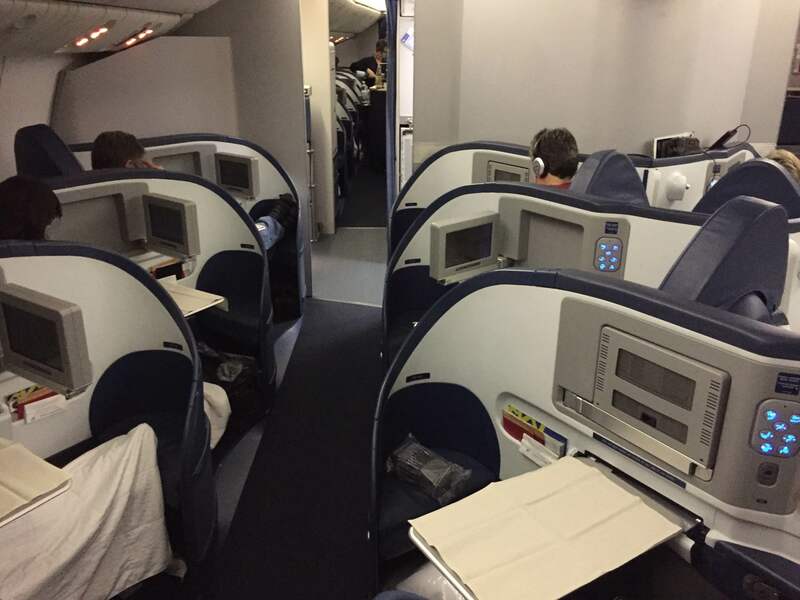 For the flight across the Pacific Ocean, I was unable to arrange for two seats together, so had upgrade both of us to the “Comfort Plus” cabin, which is the premium economy product. The only significant difference is about four additional inches of leg room plus the ability to board ahead of the other economy class passengers. The view from the jetway before we step aboard. The Boeing 777-200 is a large plane, impressive in its size. 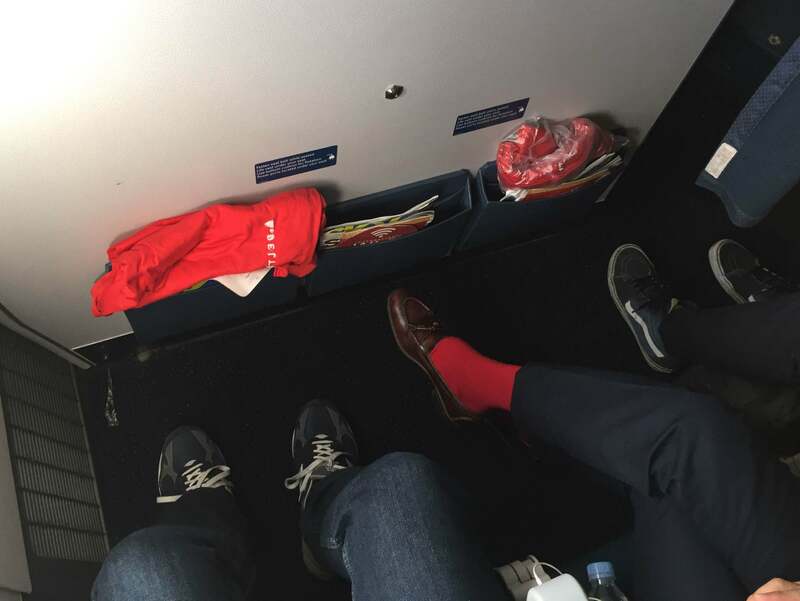 The business class and other premium economy passengers had already boarded, so we found the bins over our seats already full, and had to struggle a bit to rearrange space for our items. This was necessary as we were at a bulkhead row and could not store any personal items at our feet. 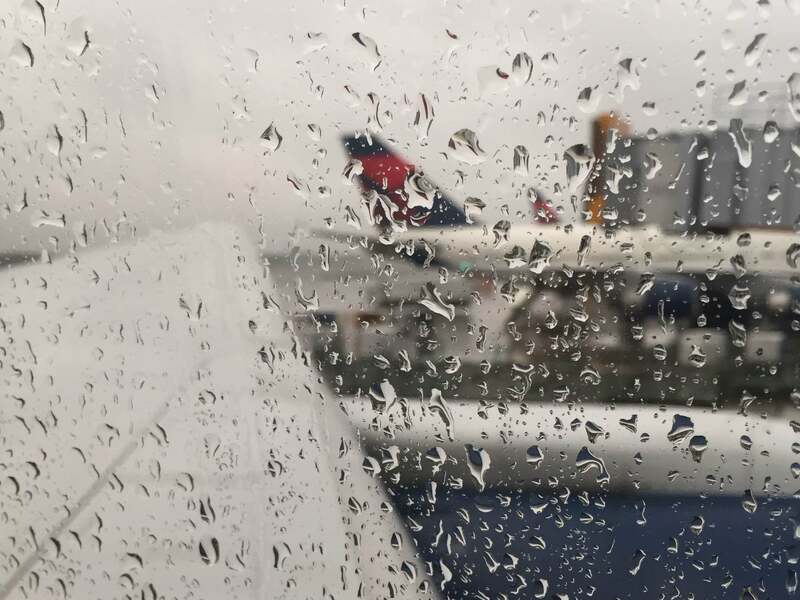 The view out the raindrop-strewn window with a Boeing 747 in the background. 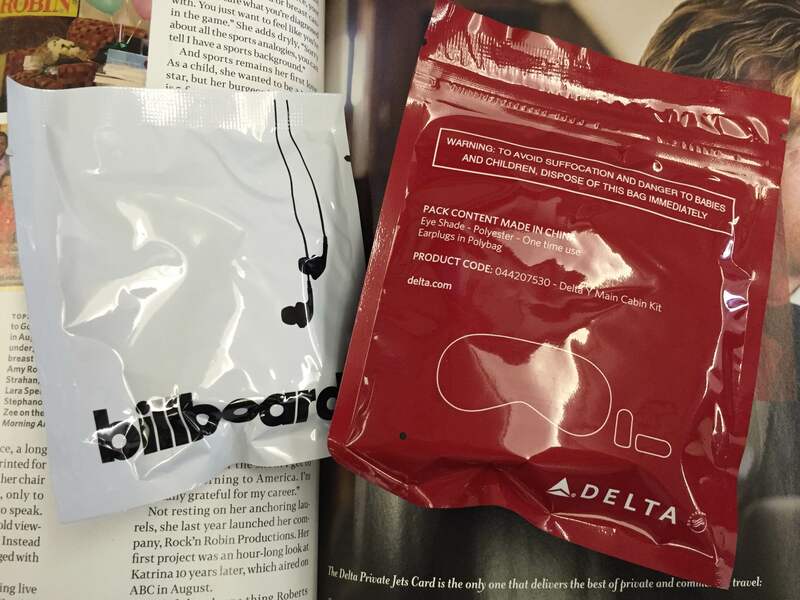 For this longer flight (about 9 hours eastbound), Delta offers a bit more in their amenity kit: toothbrush and toothpaste in addition to the eye mask and ear plugs found in the flight out of Bangkok. 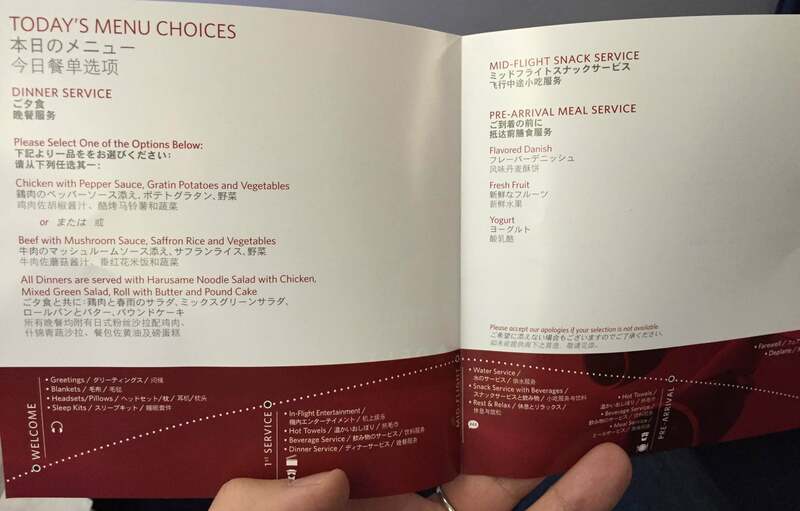 A simple printed menu laid out meal and beverage choices and at the bottom, had a clever guide to activities during different phases of flight. 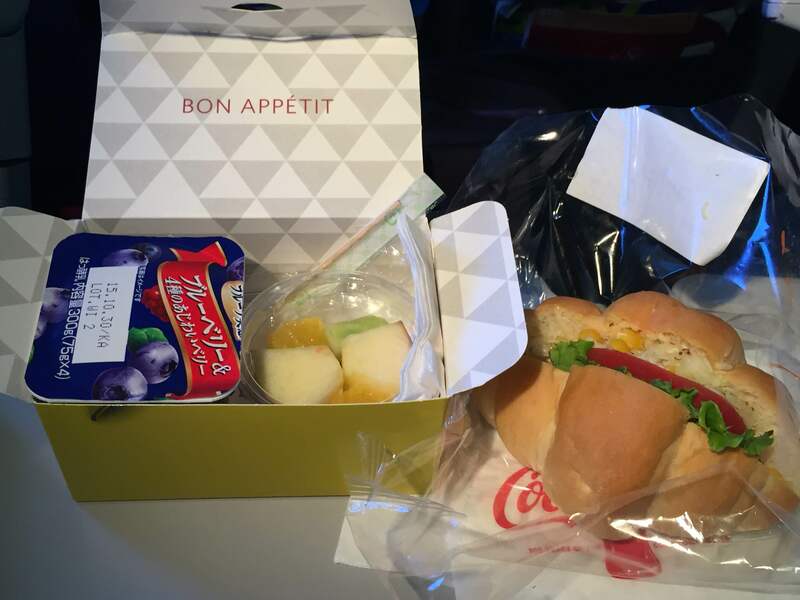 Again, I think these relatively inexpensive investments (printed menus, amenity kits) make the overall experience more pleasant and improve the passengers’ impression of the airline. 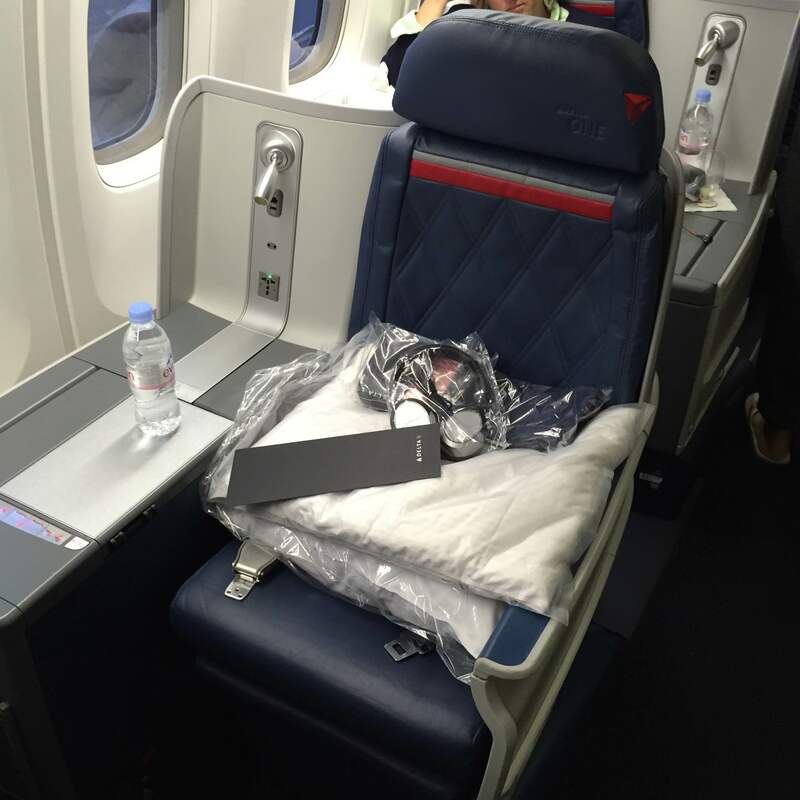 Here is a peek into the business class cabin ahead of our seats. This aircraft has business class arranged as individual pods in a “reverse Herringbone” layout, with all seats facing the aisle. I dislike this arrangement because facing the aisle means you make eye contact with anyone walking past. I also dislike this arrangement because if you are traveling with someone else, there is no way to communicate with them conveniently during the flight. 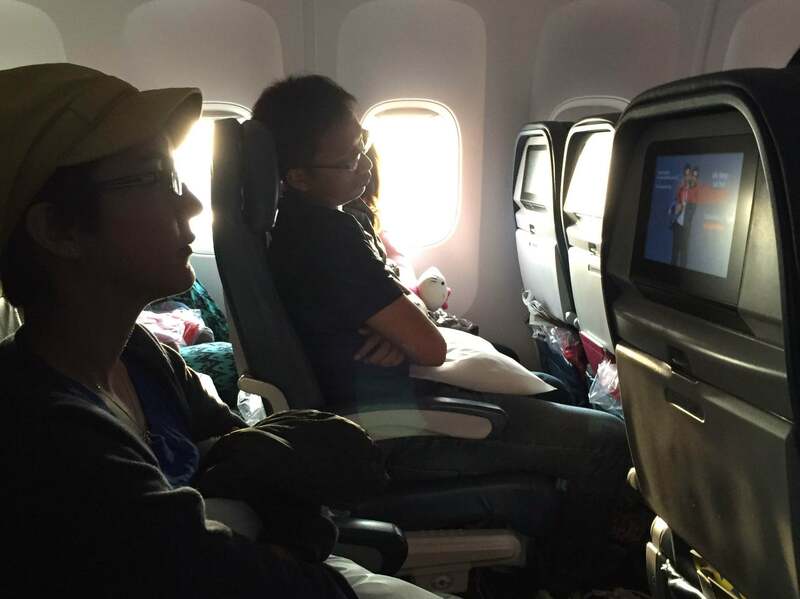 This picture, taken later in the flight, shows one passenger in business class still stretched out in the lie-flat bed position. While I’m sure the seat is comfortable, the seat still looks a bit cubicle-like. Our view a bit after takeoff, as the storm clouds reflected the fading rays of the sun. The cabin crew was just as friendly as the previous flight’s and began their service not long after reaching our cruising altitude. Nuts and pretzels were served along with our choice of drinks. 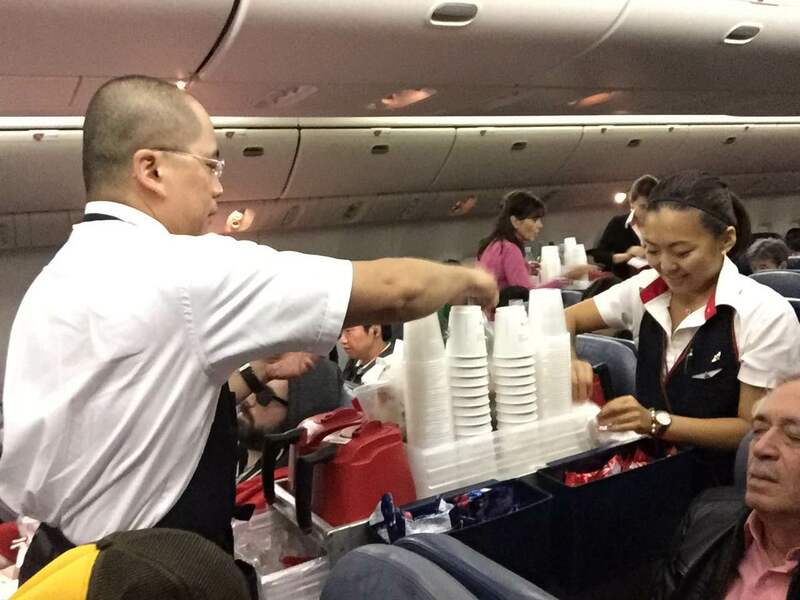 Alcoholic beverages are complimentary on the Asia flights, although it doesn’t appear that many people choose to drink. We did have a glass of wine with our dinner. My meal was tasty but nondescript: some sort of a slaw on the left with a Thai-like dressing, a hummus-like spread with asparagus, and a rice and curry dish that was tasty but difficult to identify. Tawn’s meal had some similar elements but with a regular lettuce salad and rice with roasted vegetables. Again, portion size was appropriate and the flavors were fine. 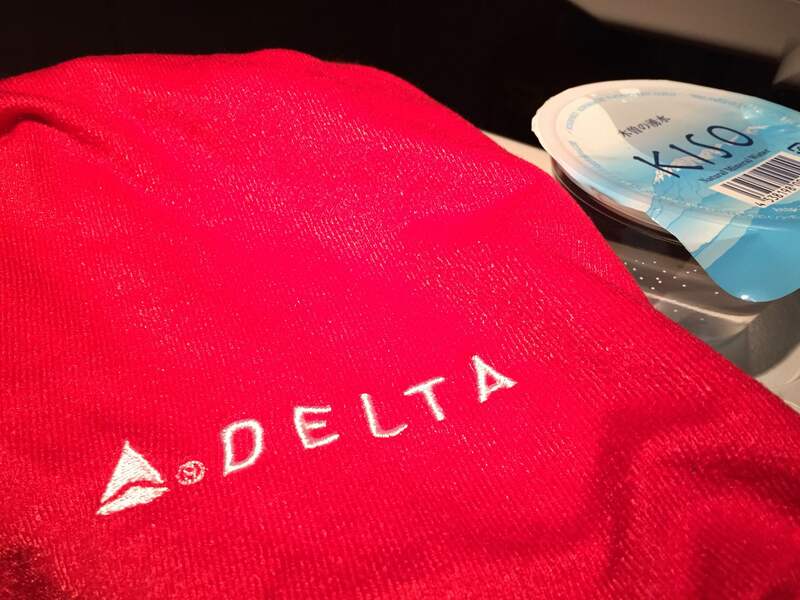 The Delta blankets are comfortable but tissue-paper thin. 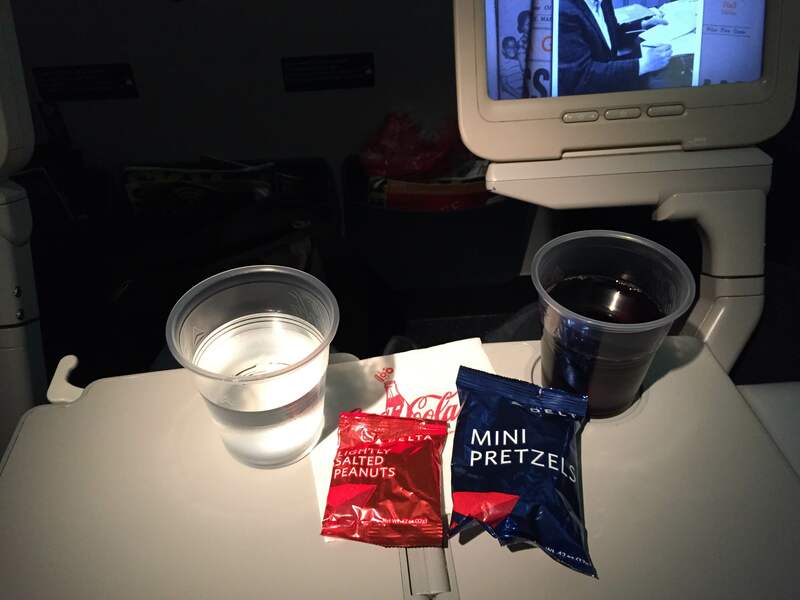 The cabin crew passed our half-liter bottles of Evian water on both flights, making it easier to stay hydrated and reducing their workload since frequent trips with a pitcher of water and cups was not necessary. This also probably reduces the amount of plastic waste, as one bottle per person is much less plastic than five or six cups would require. 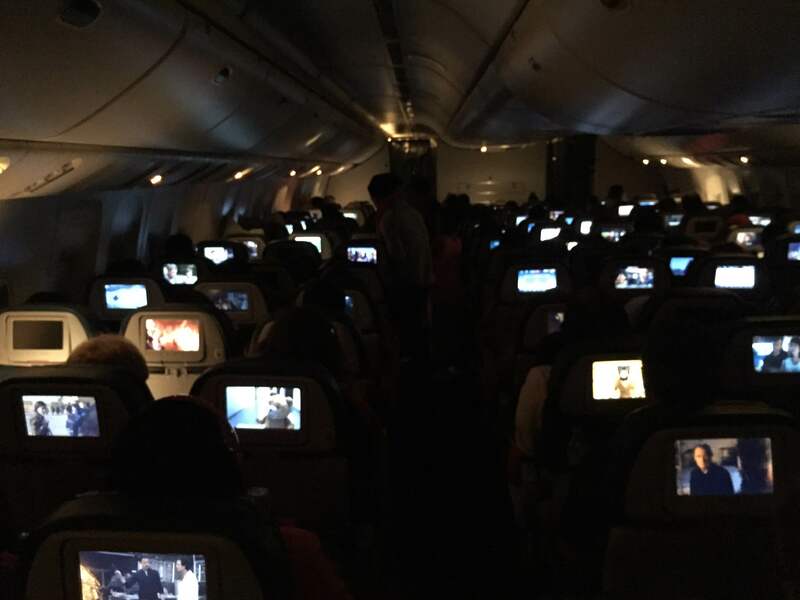 The cabin was darkened although many passengers watched movies or shows during the flight. 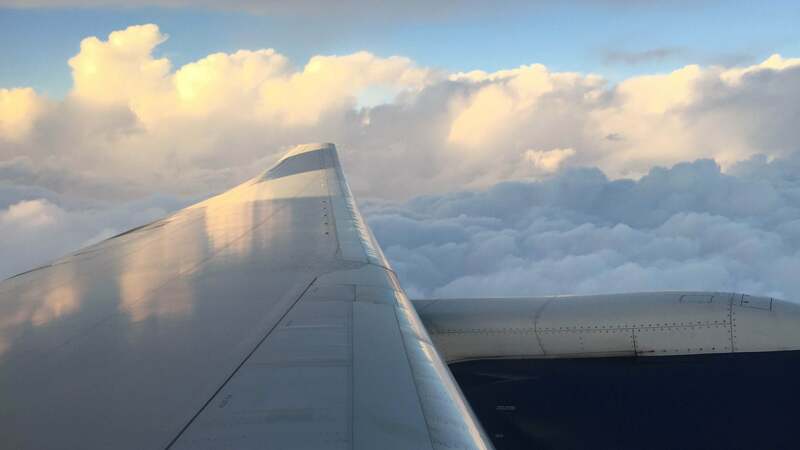 Unlike at some airlines, the Delta cabin attendants on this flight did not mandate that window shades be lowered, which was okay as the entire flight took place during the night. The sun only started rising about two hours before we landed, so having window shades opened actually allowed for a natural wakening to occur for those who were sleeping. 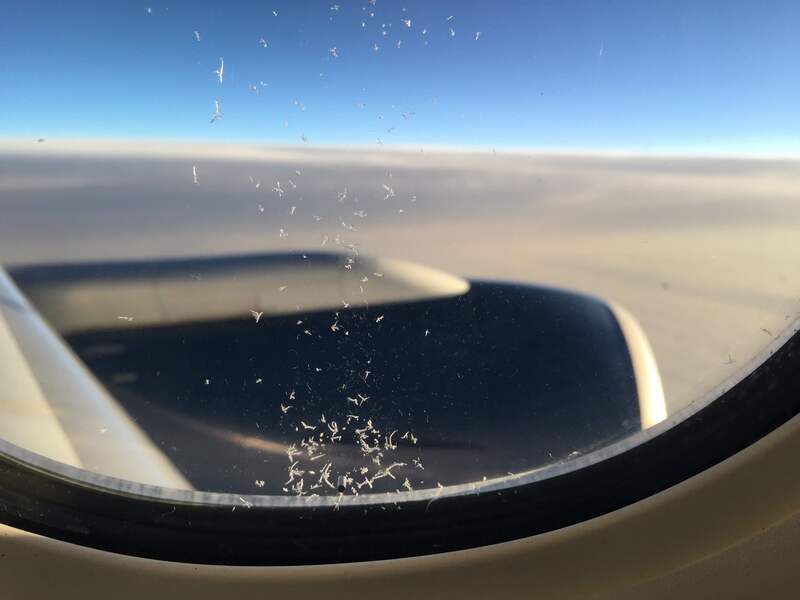 Ice crystals formed at the base of the windows, a reminder of how bitterly cold the air is at 40,000 feet. 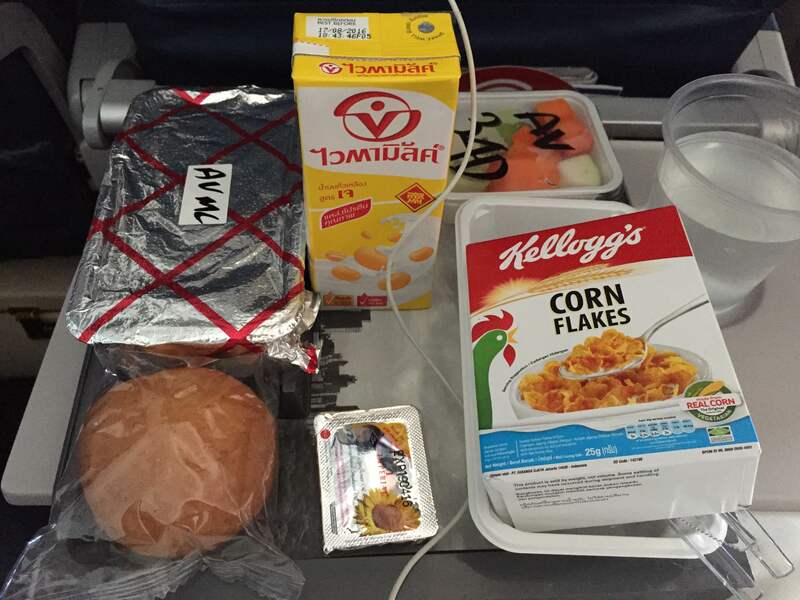 About 90 minutes before landing, the flight attendants served sandwiches and a snack box with yoghurt and fruit inside. Our sandwiches were slightly different, although mine did not have any cheese despite being a “dairy okay” vegetarian option. Plenty of tasty Starbucks coffee was served. Overall, the Delta experience was a positive one. 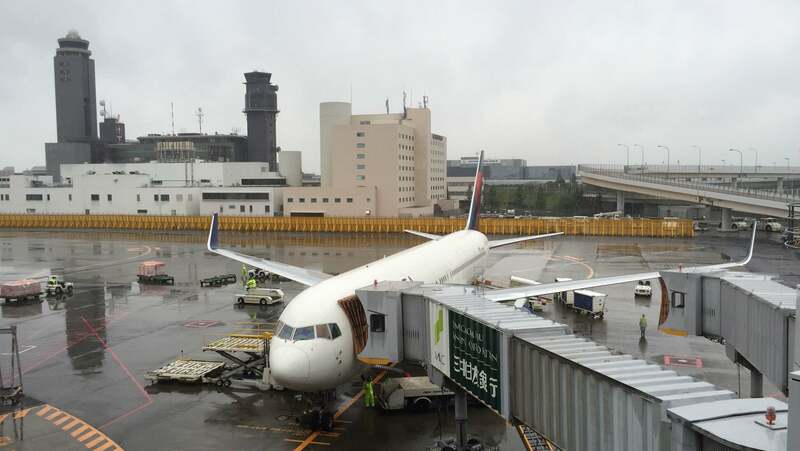 At a certain level, I would still choose an Asian-based carrier as I think the overall experience is better (especially in terms of toilet cleanliness – US-based crews don’t seem to like to keep toilets clean). 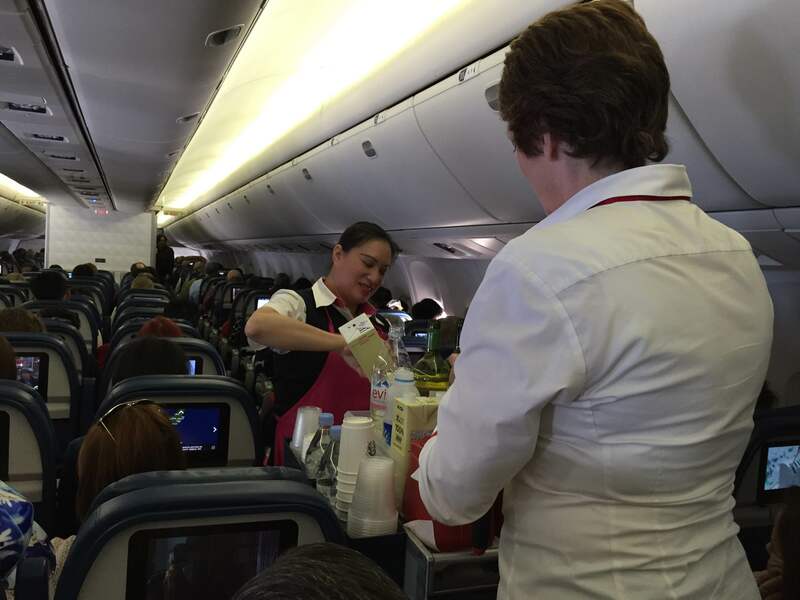 Nonetheless, the Delta crew was friendly and the hard product (seat, food, inflight entertainment) is competitive. 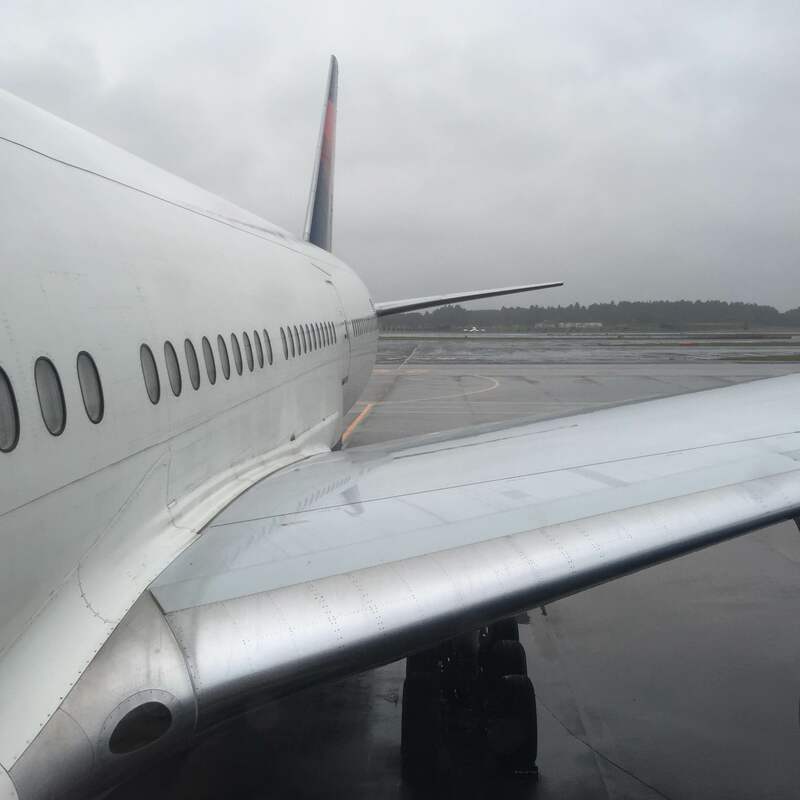 This entry was posted in Travel and tagged airline, airplane, aviation, Delta, Delta Airlines, trip report by christao408. Bookmark the permalink. What a detailed account! Though I’ll not be flying Delta anytime in the near future, this is quite a good glimpse into their long haul product. Yes, you are a bit more committed to Star Alliance. I always enjoy reading your reviews. 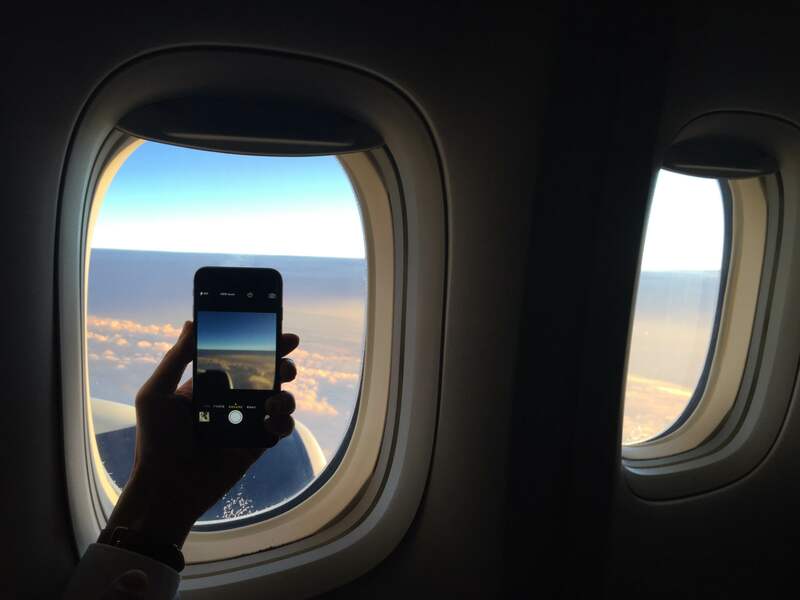 Do you take notes during the flight? I didn’t take notes in this case because the experience was quite straight-forward. For my older reviews, which were more detailed, I did take notes. With my new job and more travel, I am hoping to write more of these reviews. Wow! You’re in LA! So close to me! You sound like a happy traveler! If only all travelers were so content! I laughed at Tawn also getting corn flakes with his Asian meal hahah! Nice, detailed review. Really lets me experience what you guys did. You must really enjoy flying Chris, because you’re very consistent with these plane ride reviews. Yes, the corn flakes were really out of place! As for the flying, yes, it is my passion and I’m looking forward to doing a lot more of it in my new job. Sounds like a comfortable flight with some good food for what one can call good food on an air plane. Happy it was comfortable and met you needs. Enjoy your time in LA. You are welcome. While I think Delta Economy isn’t “too bad” the experience lags most of the Asian airlines I have flown across the Pacific. Well, traveling in business class isn’t too bad! You’re a brave soul for going coach on such a long trip let alone on a us carrier. Nice report though. as much as i like the airbus 380, i do tend to feel that i prefer the smaller planes sometimes, to avoid such a large crowd for the flight. it somehow feels less personal, less intimate, and less comfortable, when you get to see tons of people sharing the same economy cabin with you. not to mention the wait for using the toilet. 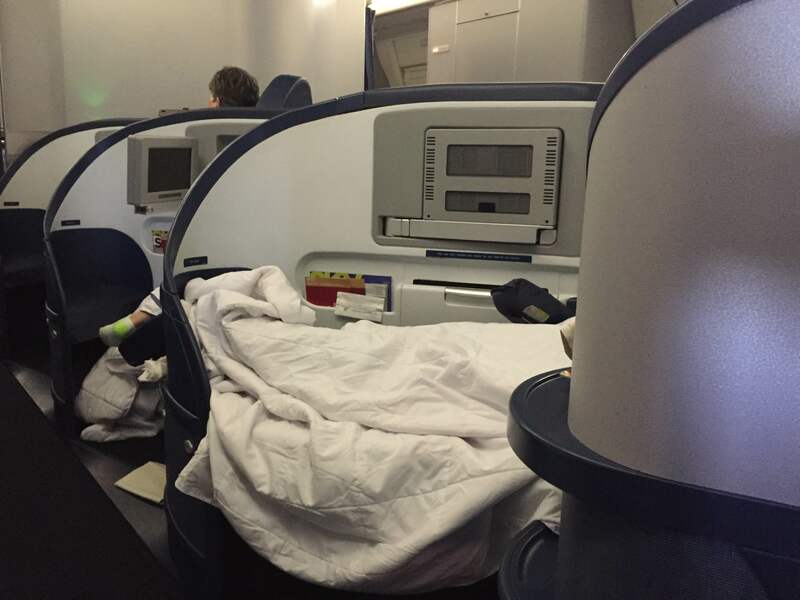 and i too dislike that layout of delta’s business class. 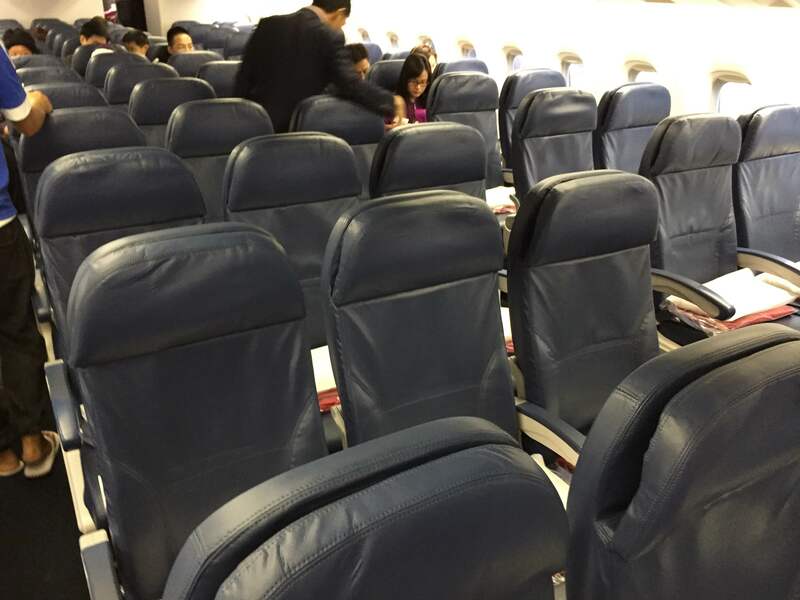 if they were to arrange the seats facing at an angle, the least they could do is to have the seats facing to the window or facing inward, for those in the middle row. anyways, as for you and tawn practicing vegetarianism, is this an annual thing for you both? for a religious or special national celebration reason? The vegetarian thing was for Tawn, and it was a specific 30-day period related to a promise made to the gods.